The illustration/cartoon is correct. 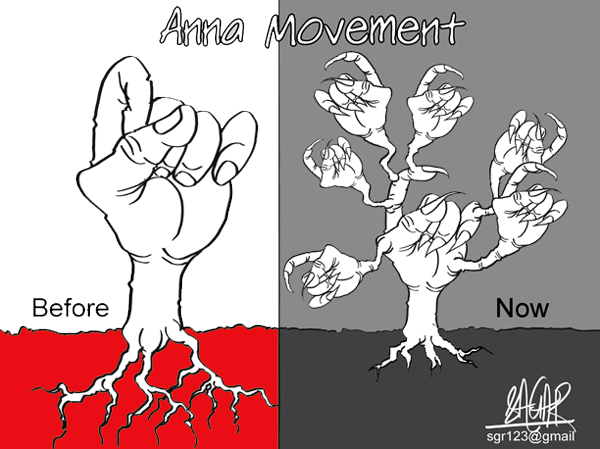 Inspite of the fact that the political analysts had stated that Anna's movement on Lokpal was more to divert the attention of the masses from the UPA government's rampant loot, the Team Anna did gather a large following and projected itself as a strong force - hence the illustration showing a strong well-knit forceful fist as "before". Now when all the pseudo sparkle has fizzed and the Team is totally disintegrated...the "now" part of the cartoon shows the Team's current status where everyone seems to be biting and nailing each other. - Great Cartoon. Thanks for making annalistic comment on my stuff.....you are right as well ...but I think, it’s a distinction of perception….